Ravens tear up this area of poorly rooted turf. Notice the water logged yellow turf. It's thatchy here. For the past few winters my course has suffered from "grub damage." 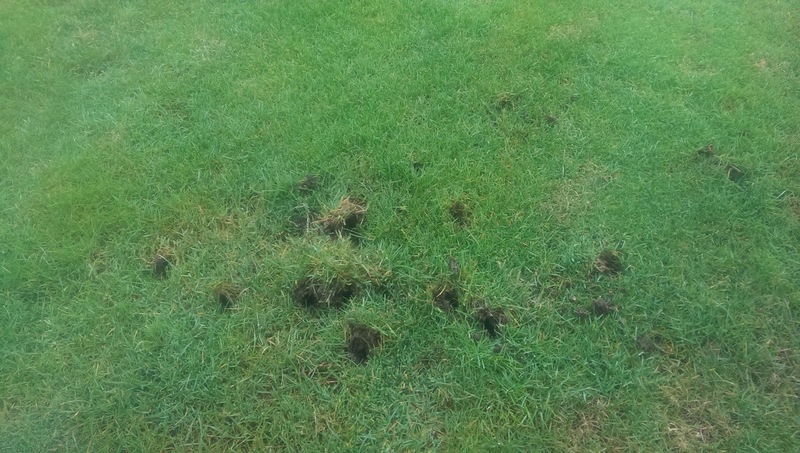 The real source of the damage is the ravens tearing the poorly rooted turf up in order to eat the grubs. Where most might first think that the Ravens are the problem I have a different approach which I have described in the following video. Simply killing the ravens will not solve the problem. Never mind the fact that ravens are a very intelligent and important species on the Coast, they aren't the problem in this situation. So if the raven is seen as a trickster I think that the joke is on the raven for his antics are actually helping us produce better more sustainable turfgrass in the long run. Let me explain. The real issue is the poorly rooted turfgrass. Killing the ravens will only leave me with poorly rooted turfgrass infested with grubs which will eventually cause more damage, this time, during the playing season. You may have noticed over the past few years the huge amount of damage caused by birds and raccoons tearing up turfgrass on city lawns and boulevards. The reason the damage is so bad is because all of this turf is poorly rooted. 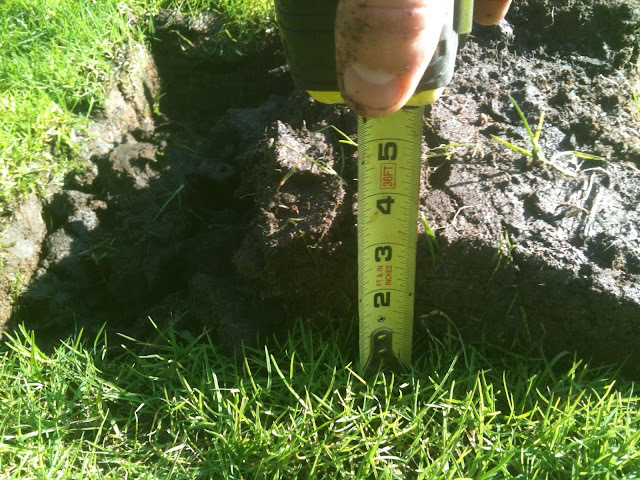 Nowadays it is common to sod lawns and boulevards and this sodded turf really never roots properly unless it is aerated like crazy which I can almost guarantee it is never aerated ever. This is one of the reasons golf course superintendents hate sod. It's a quick fix but is far inferior to seeded turf. It is incredibly hard to get sod to knit entirely to the soil unless you aerate it a lot the first few years. In my case I have grubs almost everywhere. 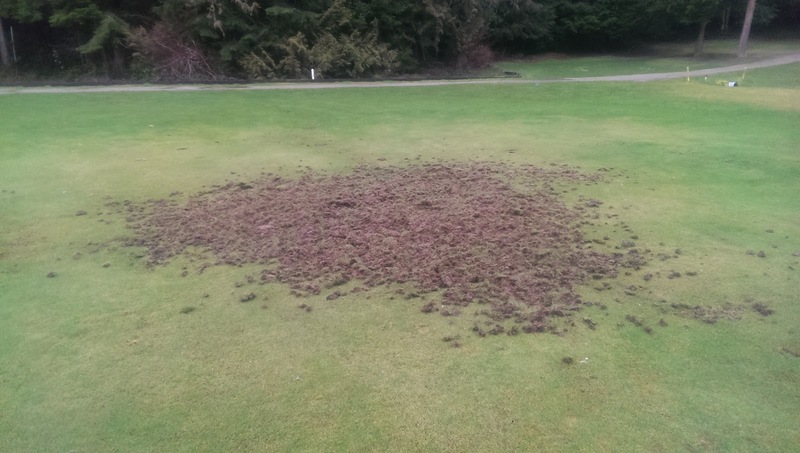 We never use insecticides on our golf course so it is expected that there will always be grubs and insects everywhere all the time. For the most part this causes almost no issues on our course except for the few hundred square meters of grass that is poorly rooted on the fairways. The reasons for the poorly rooted turf are many but mostly come down to grass that is growing in the shade with poor drainage. Grass that grows in shade is wet for longer. This leads to a buildup of thatch as the water logged conditions don't allow for adequate decomposition of the grass clippings. This thatch buildup further reduces drainage in these areas which makes them even more wet. It's a vicious circle. A thick thatch layer is the problem. In this area the thatch is almost 10cm (4") deep. We have done a lot of work to reduce the shade issues on our course over the years but the years of poor growing conditions have left many areas with a thick layer of thatch that is easily torn up by the ravens when infested with grubs. Again, at this point I am not willing to start spraying insecticide. The areas of damage are so small and hard to locate that a spot application of an insecticide would be impossible to do. A broadcast application of insecticide would also be wasteful as less than 1% of my fairway turf is impacted. Last year I honest had no clue what I was going to do with this damage. The ripped up turf area was so soft that I couldn't bring any equipment into the site without it sinking or getting stuck. For this reason I was forced to wait until it dried up a bit. At this time I was looking at a relatively large area of ripped up thatchy sod. I figured that I could mulch it up with my rotary rough mower and pack it down smooth and hope that the clubs of turf would catch and grow in. Well lucky for me this is exactly what happened. I was surprised how well it actually worked. This chronically wet and soft area quickly became one of the best stands of fairway turf on my course. Where in the past there would be wet areas even in the dry summer, there wasn't a single wet spot to be found. It seemed to me that when the ravens ripped up the thatch, they actually did me a huge favour. The removal of the thatch allowed me to mulch it up (essentially aerifying the anaerobic conditions) and allowed these areas to drain properly. This increased drainage now allows me to keep these historically wet areas dry which will hopefully lead to a further reduction in thatch in these areas. The reduction in thatch will also make it easier for me to keep these areas green in the summer as thatch can become hydrophobic if allowed to dry out where soil is less prone to this issue. So my problems are solved and all I did was be patient and allow the ravens to do the dirty work for me. I think that we are often too quick to react to issues such as this. Often if we area able to wait things out (this is obviously not always the case) we can find a better long term solution to the problem. In my case on fairways, I now welcome the ravens to rip up the turf as I know that the following year the turf will be better than ever. It's a short term pain for a long term and very cost effective and environmentally friendly gain. WWGCSA talk "4 Years of MLSN"